Since its initial launch on Earth Day 2010, CO2Scorecard.org has turned a few heads among those who follow data on carbon emissions, or the graphical display and analysis of data in general. A leading climate policy blogger Prof. Roger Pielke Jr of University of Colorado introduced CO2Scorecard to his readers soon after we launched the site. CO2Scorecard was also featured on Infosthetics.com, a weblog that explores the symbiotic relationship between creative design and the field of information visualization. 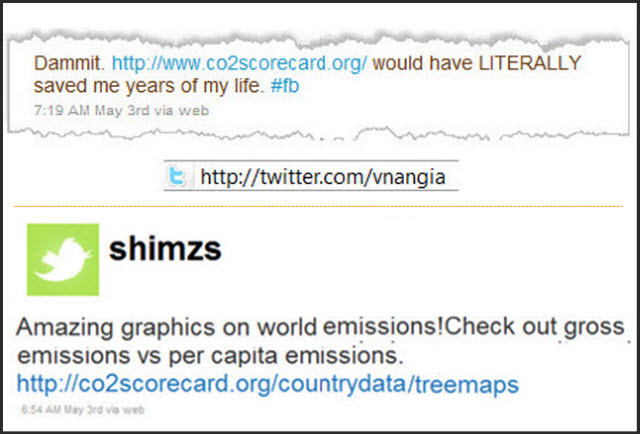 These two sources helped popularize CO2Scorecard to many users around the world. The most comprehensive independent review of the site was provided by a leading sustainable business group called JustMeans. Their news writer Madeline Ravich provides a detailed discussion of the data visualization tools available at CO2Scorecard, and we would encourage our visitors to read it as a quick introduction to the site. CO2Scorecard.org has also recently been cited in the United Nations Environment Program’s 2010 report on Global Trends in Sustainable Energy Investment. 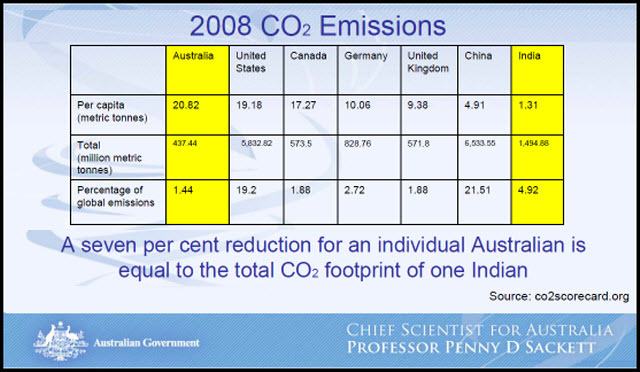 CO2Scorecard.org has attracted particular attention in Australia, where it has been cited by the Chief Scientist for the Australian government Prof. Penny Sackett in a presentation on carbon emission patterns. CO2Scorecard’s national scorecard has also been cited by the legislative leader of the Australian Green Party (Senator Bob Brown) in advocating a “green growth” path for Australia’s economy. 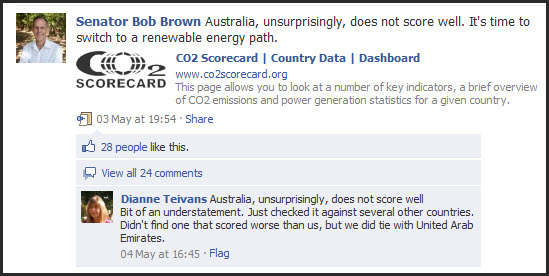 The link to CO2Scorecard posted by Senator Brown on his facebook generated a series of lively comments. Finally, CO2 Scorecard moved the meter on Twitter as well. Below are a couple of highlights from several comments on CO2Scorecard.org’s suite of data analysis and visualization tools. We are encouraged by such comments from site users.